Here is another clip from WTTW Channel 11 Sneak Previews with a review of Blade Runner, Pranks (A.K.A. Death Dorm), the Pheobe Cates - Willie Ames movie "Paradise", and the ending credits to the show. I can't believe they didn't have thumbs up or down back then. When the heck did they start that? I thought it was with them from very early on! It's a shame neither Siskel or Ebert seemed to "get" Blade Runner, which is considered a classic by most people nowadays. However, they did later amend their original review with a more positive slant. Fuzzy, this clip obviously didn't get a lot of attention early on on your site, but, you claim this clip is from 1982. 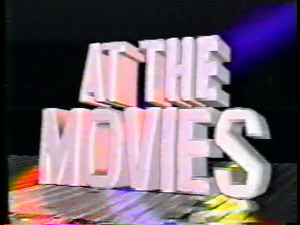 That was right when they left for "At the Movies", so, if by that time they hadn't started up doing the "Thumbs up/down", that means they never did it on "Sneak Previews", and they must have come up with it on the subsequent programs. Comment posted by afdave on Saturday, August 7th 2010 at 8:04pm. Blader runner is considered one of the best sci-fi movies of all time. Siskel says its a "Waste of time" and goes nowhere. Just shows how souless and dull he was. I guess you can blame the brain tumor for effecting his judgment. Comment posted by Mr. Hooper on Thursday, February 14th 2013 at 6:32am. Comment posted by Matt on Thursday, April 4th 2013 at 6:19pm. They used the Granada Theater at Sheridan Road near Devon Avenue for the opening and closing of "Sneak Previews." I was living at the dorm at Loyola and watched them film it. Sad that Gene Siskel, the Granada, and now Roger Ebert are gone. I hope they spend eternity at the movies together. Comment posted by HUdson 3-2700 on Thursday, April 4th 2013 at 9:26pm. HUdson: Thank you for verifying what I'd suspected for years!! As to "Blade Runner", wasn't it re-edited and re-released? I thought that that was what made Ebert change his mind about the movie. Comment posted by SuperCFL on Friday, April 5th 2013 at 7:29am. Comment posted by VintageCanada on Friday, April 5th 2013 at 5:46pm. In 1992 Roger Ebert changed his mind on "Blade Runner", but Siskel did not. Comment posted by Mr. Hooper on Saturday, April 6th 2013 at 1:23am. >> 1982 International Version (aka The Criterion Version) - Scenes that were added that were cut to secure an "R" rating. All were released on DVD, HD-DVD and Blu-ray. The DVD omits the Workprint version of the film. The HD-DVD and Blu-ray versions have the Workprint version as well as the other cuts of the film. Comment posted by Betamax75 on Saturday, April 6th 2013 at 11:31am. This clip has been viewed 4430 times. This clip debuted on FuzzyMemories.TV on Wednesday, October 17th 2007.